Effects of a mega-billion coal fired power plant and flash floods made Davaoeños fidgety over the future as terms like ‘coal’ and ‘environment’ made it to the vocabulary of ordinary folks. Elsewhere in Mindanao, mining and its dire impact projects encroaching forests and natural resources were roundly protested. DAVAO CITY, Philippines — “Dili ta gusto og dirty energy. Pero ipadayon gihapon nila. (We don’t want dirty energy. But they will still pursue the project),” says Jean Lindo, an anesthesiologist by profession and a feisty oppositionist to the Php 25-billion coal-fired power plant. These were the same words she uttered during a dialogue with the plant’s proponent, the Aboitiz Power Corporation at the Apo View Hotel. Her group, mostly composed of nuns and students, and local residents, formed the Network Opposed to Coal-fired Power Plant or No to Coal. Ordinary folks know coal as the proverbial alternative fuel in the dirty kitchen, but with debate raging the whole of the year 2011, coal has seeped into the public consciousness and carried a different meaning. For a city boasting of abundant water and cheap electricity compared to other cities in the country, Davao City is now facing an impending energy crisis, if the Aboitizes and the project’s endorser, Vice Mayor Rodrigo Duterte, are to be believed. The war over coal-fired power plant was waged at both legislative and executive chambers of the local city government. In an effort to win-over the city’s lawmakers, whose precious votes were needed to jump-start the project, the power firm funded an ocular survey at its coal-fired power plant in Misamis Oriental. The move was roundly protested, and the hype was such that even one councilor, Councilor Emmanuel Galicia, tipped off a PhP 5,000 pabaon from the firm. The city council later approved of the project in June 27, with a lone opposition coming from neophyte councilor Leah Librado-Yap. In November 15, the city council again approved an ordinance that changed the classification of the plant’s location in Barangay Binugao, Toril from one that is protected medium industrial to now a protected heavy industrial land. Davao City Mayor Sara Duterte, citing the state’s constitutional duty, vetoed the decision, a move overturned by her father, Vice Mayor Rodrigo Duterte, who led the City Council in superseding the veto. Clad with masks labeled with “Coal Kills,” various groups opposing the project lambasted the city council as favoring only to the corporate interest of the Aboitizes. Earlier, Doctor Lindo said community leaders in the fishing communities of Sirawan and Inawayan considered Mayor Sara Duterte’s veto a strong message to the Aboitizes. “Really, Aboitiz should realize that coal plants are as backward and aged as the cave men,” Lindo said. Mayor Duterte, in her veto message, pointed to the dangerous effect of the coal plant’s carbon dioxide emissions reaching to almost 3 millions of tons per year and mercury. We cannot overemphasize the economic downside of having a sickly population due to a heavily deteriorating environment and massive population. Mayor Duterte said. The dire impact of the coal-fired power plant is yet to come, but the effect of soil quarrying was seen in the flash flood in Barangay Matina Pangi last June that killed 29 people. Mines and Geosciences officials point to the unhampered quarrying that caused the heavy siltation of loose soil and constriction of river channels, that could not contain the onslaught of water. Elsewhere in Mindanao, unregulated large-scale mining, just like quarrying, aggravated the impact of heavy rains that caused killer flash floods. Typhoon Sendong claimed the lives of more than 1,000 individuals across 183 barangays in Region X including at least 280 people reported dead in Iligan City. Latest Department of Social Welfare and Development data tells that about 65,998 families have been affected by the flash floods, which carried logs from the mountains and swept away houses and other structures. Residents of Cagayan de Oro City described their encounter with typhoon Sendong and the ensuing flash floods, barely 10 days before Christmas of 2011. “Naay babae ug iyang anak naka survive kay nakasakay sila sa purtahan sa refrigerator, naabot sila’g Camiguin,” (There was a woman and her child who survived because they held on a refrigerator door; they were swept to Camiguin island),” recounted a Davao-based volunteer of the nongovernmental BALSA Mindanao, which conducted a relief mission before the year ended. While the Chamber of Mines of the Philippines have lately issued a statement saying that large-scale mining was not responsible for the Sendong tragedy and that groups who want to ban all forms of mining is using the calamity to advance their agenda, mining in Cagayan de Oro was already a hot issue way back in 2009 because of a similar flash flood that affected 30,000 people in 36 villages. Mining operations were suspended, especially concessions in the Autonomous Region of Muslim Mindanao (Lanao del Norte), which hit Cagayan de Oro and nearby provinces. In the nearby province of South Cotabato where the mining company XSTRATA-SMI is operating, residents are also worried. “Moabot ang panahon nga dunay bagyo ug mahitabo ang susamang panghitabo. Nanawagan mi nga ihunong ang pag-opereyt sa Xstrata-SMI. (Typhoon will surely come and the same incident might happen. We call the Xstrata-SMI to stop its operations. ),” said Pastor Vincent Ortiz of the United Church of Christ in the Philippines, a convener of the Church People’s Advocacy for the Integrity of God’s Creation. Church groups, farmers organizations, indigenous peoples organizations, human rights groups and militant groups have long opposed the $5.9 billion Tampakan Copper-Gold Project, claiming it poses a big threat to the environment and would drive out thousands of lumads (indigenous peoples) from their ancestral lands. The Swiss-based Xstrata is eyeing the region’s 1.1 million metric tons of gold and copper. Before the year ended, Bagong Alyansang Makabayan-Socsksargen, human rights group Karapatan and Socsksargen Agenda led a five-day march, dubbed “Lakbayan II: The fight continues against large-scale mining and human rights violation” last December 6. It culminated with protesters painting “CLOSED” on the Xstrata-SMI office. Protesters also demanded the passage of the People’s Mining Bill. In the countryside, indigenous peoples have pledged to wage a pangayaw (tribal war) against the Xstrata-SMI. The South Cotabato province has also imposed a ban on open-pit mining. “Considering the number of large-scale mining permits approved so far by the government, (President Aquino) is practically mandating the mass destruction of forests and key biodiversity areas,” said Frances Quimpo of the Center for Environmental Concerns-Philippines. According to some people, several countries are still constructing coal plant. They use this fact as a justification for the putting up of coal plant in Davao City. While it is true that there are still countries that put up coal plants, this is not a genuine argument for development. This only means that corporations dictate the countries’ energy policies to suit their businesses. This only reflects that the pattern of power relationship between corporations and governments and its accompanying corruption is global. We in ACWAD are disturbed, knowing that even as we known to be agents of change and protectors of nature, we also intrude on her and disturb her rhythm. we often forget that the web of life connects us all: what we destroy will destroy us in return. We realize that we must reclaim a sense of responsibility for nature, for the earth, for creation, because this is a mandate from God – a mandate that must be carried out to ensure a sustainable future for succeeding generations. We should continue to develop a strengthen a spirituality that approaches nature with reverence, listens to it with respect, recognizes and understands its language, and accepts that humankind is not the center of creation. With this realization, as bearers of the Gospel, we must accept the challenge to be agents of hope, ever striving to overcome frustration and despair. Every act will contribute to make a difference, even the seemingly small initiatives in our communities, in religious congregations and in the Association itself ( AMRSP Statement 2011). In this, we draw inspiration from various stakeholders; the practitioners in opposing environmentally destructive projects like Coal Fired Power Plant. 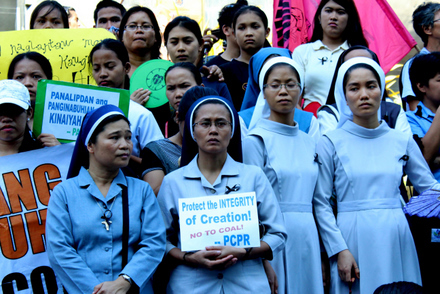 RESPECT GOD’S CREATION AND STOP THE CONSTRUCTION OF ABOITEZ’S COAL FIRED POWER PLANT IN DAVAO! Our NO to Coal fired Power is our collective response.